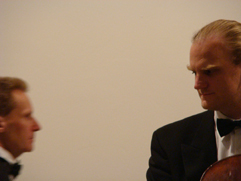 You are invited to Slovak premiere of concert "Weinberger Tour", featuring cellist František Brikcius and pianist Tomáš Víšek, to be held on Friday 1st October 2010, 7pm, at the Malé koncertní studio of Slovak Radio in Bratislava. Concert, followed by interview with artists, will be broadcast live by Slovak radio. On concert "Weinberger Tour" you can hear, in Slovak premiere, works by Jewish composer Jaromír Weinberger, "Terezín" composers James Simon, Erwina Schulhoffa and Czech organist and composer Irena Kosíková. 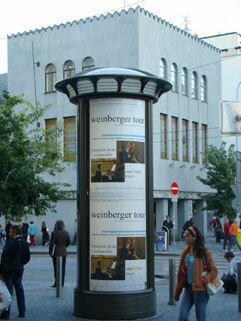 Concert "Weinberger Tour", as part of the Festival Rádio Devín, is in cooperation with the Slovak Radio and the Czech Centre in Bratislava. More info is available on websites http://www.Brikcius.com , http://www.Rozhlas.sk , http://www.CZC.sk , http://www.Musica.cz/Visek a http://www.iKosik.com . 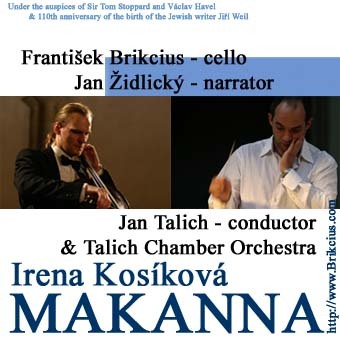 What anniversary reminded serious of concert "Weinberger Tour" of Czech cellist František Brikcius and pianist Tomáš Víšek? Contest is over, lucky winner is: H. B. from Chomutov. 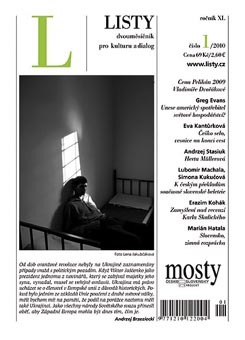 Listy - magazine for culture and dialog. Listy is media partner of project "eSACHERe". 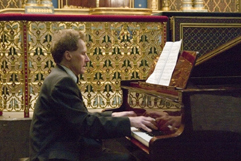 František Brikcius: Mr. Víšek, you studied in Prague at the Conservatory with Prof. Valentina Kameníková and Prof. Zdeněk Kožina, as well as at the Academy of Music with Prof. Josef Páleníček and Prof. Zdeněk Jílek. How have these teachers influenced you? 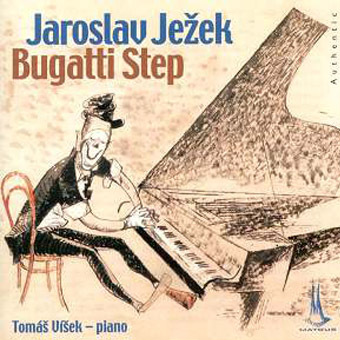 Tomáš Víšek: Prof. Kameníková was the first to develop my piano technique. Prof. Kožina only taught me for a short time but I gained from him much needed self-confidence before my final conservatory and AMU entry exams. Prof. Páleniček encouraged me to hear the piano as an orchestra. Prof. Jílek knew, when he told me something, that he needed to give me time to go home and think about it, and to discover, 90% of the time, that he was right. That kind of approach was perfect for me. I also have to mention my first teacher Prof. Pave Svoboda who, when others were using "Kurz's method" (very often not correctly understood), took me deeply into the music and developed my skills from my first steps on Bach, Mozart, Beethoven, Schumann, Chopin … If I had had a different teacher, I would possibly not be playing today. F.B. : You won several International Piano Interpretation competitions (for example, the Chopin Competition in Warsaw, the Smetana Competition in Hradec Králové, the Vienna International Music Competition, the Ibla Piano Competition in Raguse and the Concours Milosz Magin in Paris). Did these affect your professional career? T. V.: I was more affected by competitions where I did not succeed! Immediately I evaluated what had happened, what I should be doing next and eventually why I (sometimes the whole of Czechoslovakia!) missed the boat. Often, for example, I was told what each competition would be like, to find in reality that it was very different. As far as concert engagements or contacts abroad are concerned, those only really came about following the competition in Vienna. F.B. : As solo pianist you have appeared at many festivals and concerts in the Czech Republic (Prague Spring, Musica Iudaica) and abroad (Austria, Bulgaria, Egypt, France, Germany, Italy, Japan, Hungary, Poland, Russia, Slovenia, Switzerland). What is your favourite method of transport? T. V.: Definitely train – though if I have to travel overnight, then the aeroplane of course. F.B. 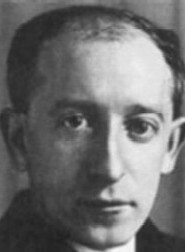 : As part of the 40th anniversary commemorations of the death of the Jewish composer Jaromír Weinberger, you took part in a series of concerts, the "Weinberger Tour", featuring compositions by so-called "Terezín" composers. What do you think about the compositions written by Jewish composers? T. V.: My relationship with Jewish music began in 1974, when I heard some performances of compositions by E. Schulhoff (mainly those inspired by jazz) and I liked them very much. 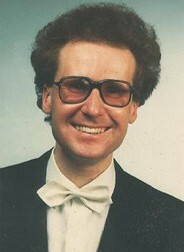 Then, in 1987, I premiered the piano concerto "In memory of Gideon Klein" by Vojtěch Saudek. You could say that I started to perform Jewish music regularly (if you don't mean, for example, Mendelssohn and Gershwin who were Jewish as well) after the Revolution. In 1990 I was a last minute stand-in at a recital of Jewish music for Radio France in Paris (with compositions by Klein, Ullmann and Reiner). And since then, Jewish music has never let me go. For a time there was a Jewish music boom. There was the festival Musica Iudaica, where I had several opportunities to perform. Supraphon planned a complete recording of Schulhoff and others - all this is unfortunately past now. Jewish music charmed me with its intonations - not dissimilar to gypsy music, this kind of "no home to go to" you can hear and from this are created very suggestive pieces. I'm sorry, that as someone who is not Jewish, I can't describe it better. F.B. : What is important for you when planning a concert? T. V.: I like to create a programme around a theme - of course, in a programme called "Czech piano miniatures" I can choose much more, than if I'm playing for example "Piano music that has been inspired by artists", where are very few pieces to choose from. I'm always trying to combine well-known pieces, with repertoire that is unknown or less well-known but no less beautiful or interesting. I take the same approach when planning CD recordings. F.B. : On Friday 1st October 2010, you will perform at a concert in Bratislava as part of the "Weinberger Tour" which will be broadcast live by Slovak Radio as part of the Radio Devin Festival. What are your future plans? T. V.: There are plenty of plans and projects and I would like to bring at least few of them to fruition. Some of them can be realised without raising financial support, but this is another chapter. I would love to spend some time on Chopin this year (his 200th anniversary) and I am also preparing for publication a composition inspired by Chopin. I am also writing a dissertation on Dvořák – there is a lot of work awaiting me regarding that. But this work is still ongoing, so, for reasons of superstition, I shall not reveal more details for now. F.B. : What is your favourite instrument and/or concert? T. V.: There are many memories and at each concert, you are trying to give your best so it's difficult to single out any of them. This year I performed for the first time in the USA. My first concert there was in New York at "Barge Music" – a concert hall (with a Steinway) on a boat docked under Brooklyn Bridge. It's hard to not remember that occasion, especially as while I am performing the whole boat is swinging, (the piano was luckily attached to the deck, floor)! Anyway, it's always a celebration to touch the same piano as Suk, Ježek, Fibich and so on, just to name few pianos I have been fortunate to play. F.B. : Have you experienced anything nice recently? T. V.: For now, I am very happy that I will be performing in Slovakia after almost 20 years. F.B. : Thank you, Mr. Víšek, for your time. For more about Tomáš Víšek visit http://www.Brikcius.com , http://www.TomasVisek.cz and http://En.Wikipedia.org/Wiki/Tomáš_Víšek . Support release of new CD "MAKANNA"!